Amazoning presents, lunch dates with people you’ve “been meaning to catch up with”, cookie exchanges, cocktails with work friends, gooey, gooey snowman projects, and the making of an ultimate “GET ME TO THE NEW YEAR” to-do list. Or at least that’s what is on OUR list, plus more. Hence the need to book yogic moments and commit to them NOW. Here are our best laid plans for the next few days! From restorative yoga and healing to a sing-a-long, we’ve found it ALL. After that, Jamie will lead an hour of Restorative Yoga practice to reset the nervous system, and once relaxed Viki will guide you through energetically clearing breathwork. There will be time for Q&A after our practice. Create time for serious self-care as we move into the heart of the holiday season. Join international master teacher Rocky Heron for an illuminating and transformative learning opportunity. The key to physical empowerment is diversity of movement. All too often we exchange habitual movement patterns off the mat for likewise limiting patterns in our practice and teaching. In Skills and Drills we will use traditional yoga asana and transitions as a springboard to explore your bodies potential to move, and achieve optimal mobility in all directions. We will pull, jump, bounce, lift, tone, stabilize, and play our way into greater possibilities, unlocking the keys to success in your physical practice, and the power within you to express and enjoy your body! Guests will enjoy a guided meditation with Kim Bradle complemented by Aromatherapy. There will also be a Nutritionist tutorial on Clean Eating and Food Prep. Guests may also enjoy Chair Massages, Reiki and Henna Tattoos as well as learn more about safer beauty and holistic approaches. This two-hour workshop is designed to take your hips into freedom and then flight. 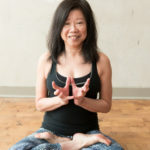 Starting with an hour of Yin Yoga, with well-known Yin teacher Ellen Mosko followed by an hour of a Master Class with Cathy Madeo you’ll explore how bringing more passive opening to your body can offer you the freedom you need to actively engage. The workshop will focus on the hips. By using two dynamic but opposite ways to engage, you’ll find how you can harness stillness into dynamic movement. Live singing bowls and guitar will be played by Robin Lee. An experience not to be missed! Holiday Sing-A-Long, Reiki Balancing, and Cheer! Come celebrate some holiday cheer! As the holiday season ramps up, take some time for yourself to socialize, sing, and balance yourself. There will be snacks to share and time to gather. We will also have the Maha Moksha Orchestra comprised of Reverend Jaganath Carrera and seven other wonderful musicians. Join in for some holiday songs/chants to lift the spirit. Shelly James Douglas will also conduct a group balancing Reiki session to soothe and balance the body/mind/spirit. This workshop was created just for boys, to introduce them to the benefits of yoga and show them that it’s a lot more than a physical practice that makes you feel good. Through challenging poses, breathwork and mindfulness, boys will build strength and balance, fire up their focus and concentration, develop positive self-image and body awareness. They will learn that yoga is all about the connections we make -– to our bodies, our minds and ourselves. This class will provide boys with a supportive, non-competitive space where they can sweat and sink into deep relaxation. Explore the foundational principle in all asana practice and mastery of it’s associated psychology. When we tone mula bandah we take care of all root issues around survival, sexual energy, and our fears. We learn how to honor our inner animal and choose resourceful ways of expressing ourselves as an animal. Mula Bandah, “root lock” can begin as a physical contraction, and over time become a more energetic lift. It is at the root of the nervous system, and responsible for toning the vagus nerve. With the practice of mula bandah we can stabilze the mind, and achieve mental clarity, as we relieve ourselves from the weight of past traumas. As parents, sometimes we’re the last ones to do things for ourselves when we need it the most! Join us for our monthly transformative Kundalini yoga and meditation escape to help balance your chakras, increase energy, spark mental vitality and experience deep relaxation. No experience necessary! Doggy Noses & Yoga Poses – Jersey Growl Barks and Brews With A Bend! Join us as we present Doggy Noses & Yoga Poses to benefit Road Trip Rescues! You do the yoga while the pups do the cuddles! Adorable ADOPTABLE puppies and dogs will be allowed to ROAM FREELY and interact with you during this one-hour mixed level yoga class featuring purespace studio instructor Alyssia Saporito, RYT-200 so be prepared to get puppy kisses! Pawssport holders will also be entitled to a complimentary pint after the class.